For the sweet-toothed, a meal is not complete without ending it with dessert, and some of them are just extra delicious (and sinful!) when topped with a scoop of ice cream. There's something about ice cream that often brings out the kid in us; and having a cake, a cookie, a pastry, or anything sweet served à la mode presents an indulgent dessert for the sugar-craving palate. The French term 'a la mode' was originally used to describe something in style or in fashion, but it's now commonplace to find it printed on a restaurant's dessert menu as an item served with ice cream (usually it's a scoop of vanilla ice cream, but any flavor will do--we're not picky). When spoonfuls of cold and smooth ice cream meet a warm and chewy, gooey, or crunchy treat, the combinations of flavor and textures feel like a party in your mouth. Dual-temperature desserts, such as a warm cake meeting a scoop of vanilla ice cream, has been a classic combination for dessert. 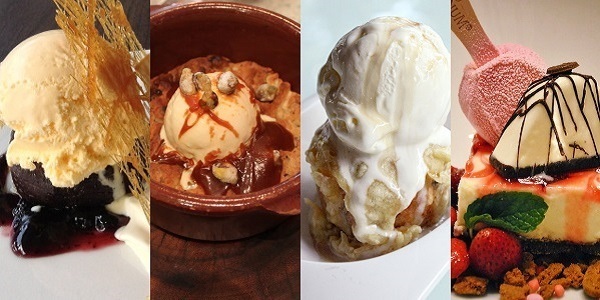 If you crave for your desserts to be topped with ice cream, check out these 11 restaurants in Manila and see what a la mode sweetness they have to offer! Outback has this pecan brownie that's topped with rich vanilla ice cream, drizzled with warm chocolate sauce and chocolate shavings, then finished off with whipped cream. Make sure you have friends around to share this monster dessert. We hear it clocks in at a whopping 1,581 calories. No one counts calories during dessert, right...? You can line up to make your own Magnum bar, sure, but check out their plated sweets to experience a magnum bar-topped dessert. 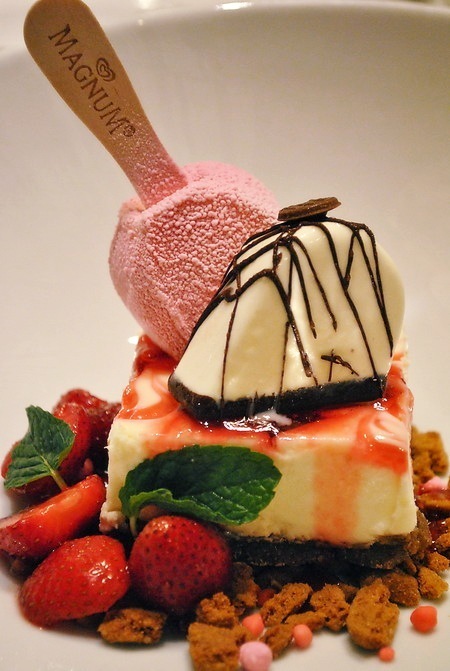 They have a strawberry marbled cheesecake on a bed of speculoos tea cookies and strawberry nerds with a vanilla Magnum dusted with pink chocolate and strawberry coulis. There's the colorful Rainbow Dream that's a slice of cream cheese rainbow cake topped with a white chocolate covered vanilla Magnum bar covered in rainbow cake crumble. For Chocoholics? Death by Chocolate combines a moist dark chocolate lava cake, chocolate truffle Magnum, brownie pieces and chocolate crispearls. Breakfast fare and comfort food eats make you feel at home in B&P. 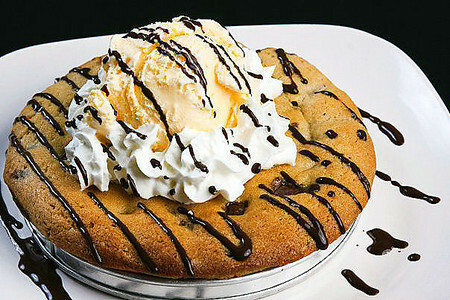 This restaurant in Shaw also serves an a la mode delight: two layers of crisp chocolate chip cookies in rich vanilla ice cream topped with whipped cream. Good to share (or good for one famished dessertarian), a serving of this cookie is something that kids and kids at heart will enjoy. Cookies are a lot of fun when you serve them with ice cream, and Wicked Kitchen has its own version of a cookie a la mode to devour in glee. This restaurant offers desserts that are named after the seven deadly sins, and the most coveted of all is called Gluttony. This mutant cookie has a diameter the length of a regular utensil, thickness of almost an inch, a full scoop of mantecado ice cream, and a drizzling of chocolate syrup. Gluttonous for more ice cream topped cookies? 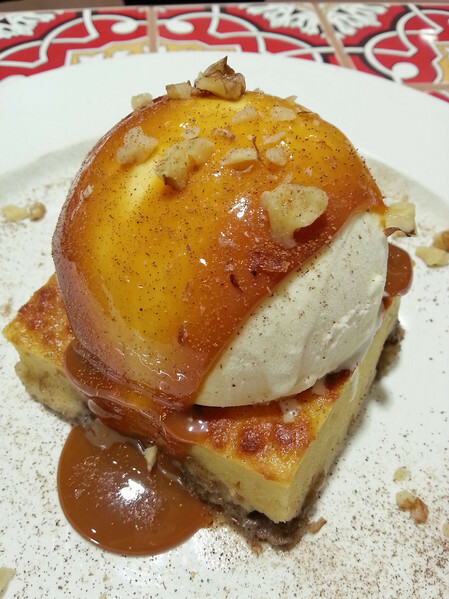 Head to Stella in BGC for dessert, because it’s a sin not to partake of Stella's cookie dough with ice cream. 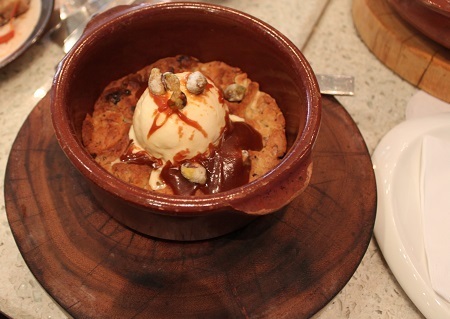 It's a combination of hot and soft cookie dough with rosemary pistachios, and then topped with Mantecado ice cream and salted caramel. Mmmm, cookie. 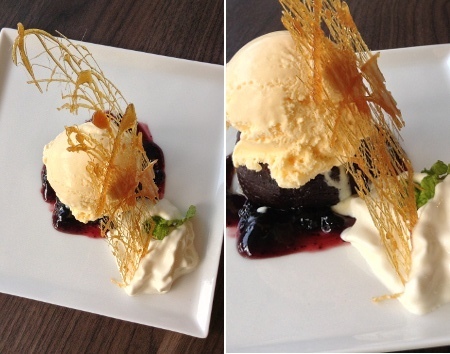 This restaurant by The Coffee Bean & Tea Leaf offers two desserts served with ice cream. Try the Apple Crumble à la Mode to bring you memories of childhood, if not make you squeal like a child with every crumbly spoonful. The Choco Lava à la Mode lives up to expectation, with the melting of cold vanilla ice cream and dark warm fudge never failing to satisfy. For fans of classic dual-temperature desserts, these two are a must try. 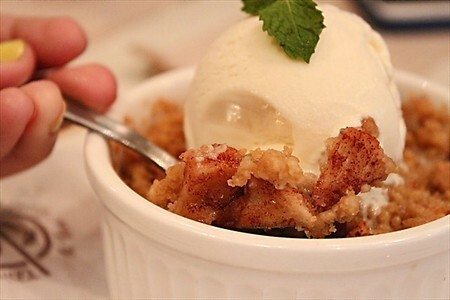 Wicked in Shang mall offers an apple pie and muffin mash-up in their Stepmother Apple Pie. Like its traditional counterpart, the Wicked Stepmother Apple Pie has discernible chunks of apples and is topped with streusel for texture. 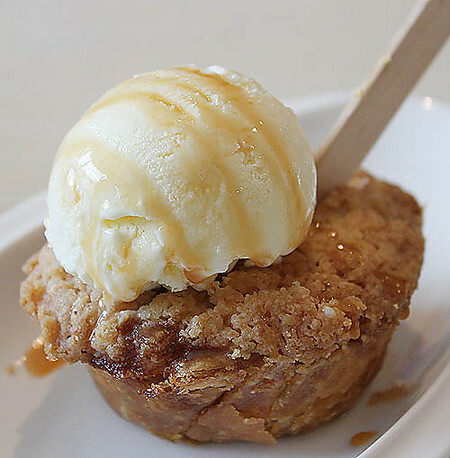 Served with a scoop of vanilla ice cream, the apple pie muffin features great contrast in texture and temperature. If you have Privileges on ClickTheCity App, treat yourself to a free order of this a la mode item for a minimum purchase of P700. 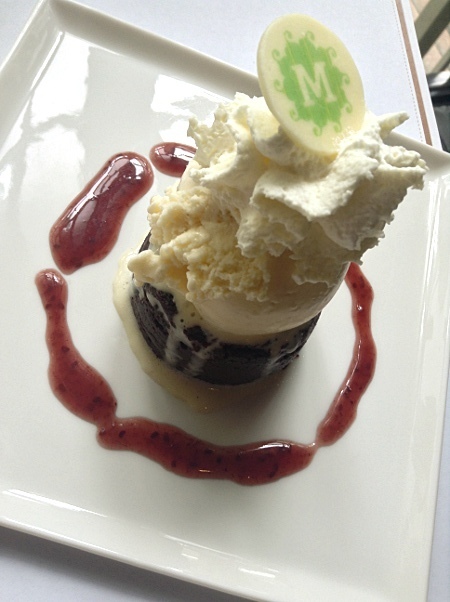 Mesclun's chocolate cake is warm, indulgent, and served a la mode with vanilla ice cream. The cold-meets-hot dessert can look messy on the plate as soon as the ice cream melts, but you'll find yourself licking your spoon clean and wiping the plate dry. For the fruit-loving sweet toothed, the Mango and Condensed Milk Crepe is also served a la mode. 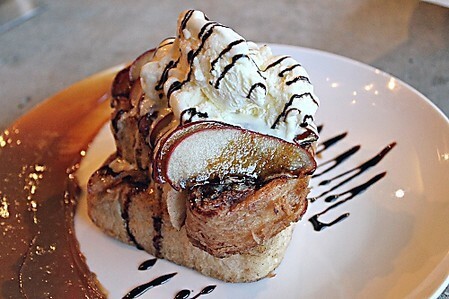 Tipple & Slaw is popular for their sandwich lineup, and this is also carried over to their dessert--two sandwich desserts are available: the Smores Ice Cream Sandwich and the Apple Pie French Toast. The latter is a plate showcasing two fluffy pieces of french toast, drenched in sweetness of slowly melting vanilla ice cream. It sandwiches grilled apple slices, caramel sauce, cinnamon dust, and powdered sugar. There's also a drizzle of balsamic vinegar reduction, its acidity cutting the sweet to counter that cloying kind of sugar high. Don't forget to mop up with your toast the smear of ducle de leche on the plate. 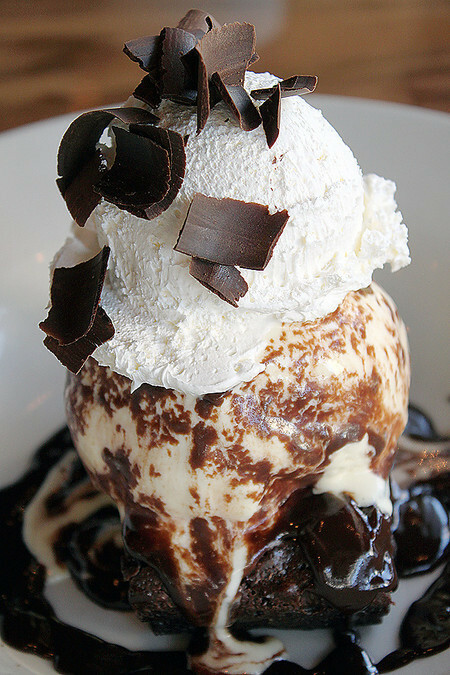 Chili's is known for their classic dessert of warm chocolate cake, which has chocolate fudge filling and is topped with vanilla ice cream under a crunchy chocolate shell. 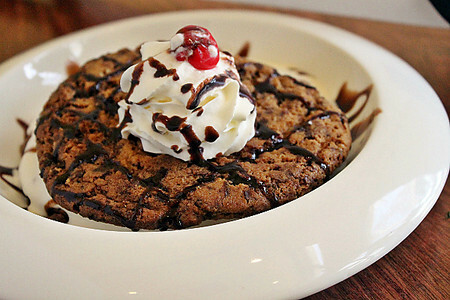 Their oven-baked skillet chocolate chip cookie is also served a la mode, topped with vanilla ice cream and a drizzle of hot fudge.Their new 'My Way' menu also includes a beautiful two-storey banana bread pudding with vanilla ice cream, cinnamon, chopped walnuts, and caramel drizzle. Round up friends and order all three for your a la mode overload! This all-day dining and watering hole in Greenhills and UP Town Center is known mostly for their creative renditions of sushi, steak, and pizzas, but do leave room for dessert. 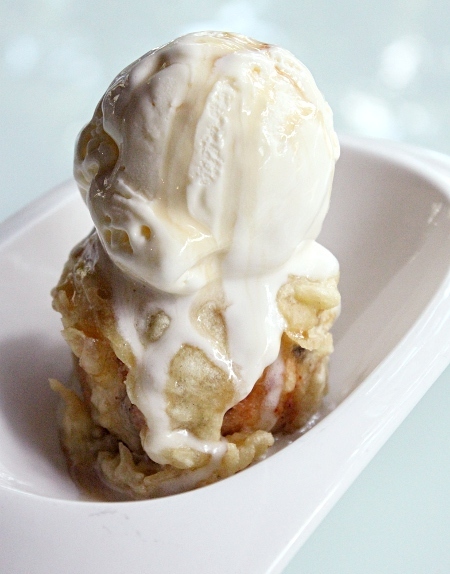 End your meal with the Fried Bread Pudding topped with vanilla ice cream: a crisp, golden brown ball of pudding that's crusty and cold in the outside, and soft, creamy and warm on the inside. Want to end your meal with some sparkle? Not only does their chocolate lava cake come topped with ice cream, it arrives with a fountain candle for moments that need extra sparkly effects, like your birthday, an anniversary, or just because you want some sparkle. Toss away your calorie counters and ready your sweet teeth for Manila’s most sinful dessert creations. Find out where you can treat your tastebuds to some of the metro's unique ice cream flavors in this list!